"Mir Sayyid Ali Hamadani (Persian: Ù�Û�Ø± Ø³Û�Ø¯ Ø¹Ù�Û� Û�Ù�Ø¯Ø§Ù�Û�â��â��â��; 1314â��1384) was a Persian SÅ«fÄ« of the KubrÄ�wÄ« order, a poet and a prominent Shafi'i Muslim scholar. 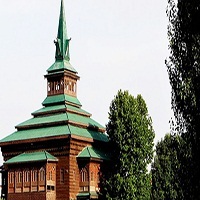 He was born in Hamadan,and was buried in Khatlan.He played a major role in spreading Islam in Kashmir." He has also influenced the culture of the Kashmir valley. He was known as ShÄ�h-e-HamadÄ�n ("King of HamadÄ�n") and AmÄ«r-i KabÄ«r ("the Great Commander") and Hazrat Ali Sani ("secound Ali").There is a belief that Hamadani died at Wafat Gah, a graveyard near Nokot village in modern Mansehra District, Pakistan. His body was carried by his disciples to Khatlan, Tajikistan, where his shrine is located.Traditionally, Hamadani is regarded as the founder of weaving craft in Kashmir. It is said that he brought with him 700 weavers who taught the craft of making cashmere wool and pashmina to the local population.In 1480, this Shrine was almost ruined in a devastating fire. Sultan Hassan Shah was ruler at that time. He constructed the shrine again in 1493 AD, in a two-storied form.